Karibu (i.e. 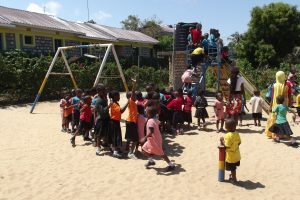 welcome) at Ratinga Primary School (RPS), our fifth (and currently last) school. Ratinga was originally a kindergarten, which was founded by the Hinssen and Jacobs families from (!) Ratingen. The project was difficult to manage from Germany so the families, who have been sponsors of Watoto for many years, entrusted Mekaela Academies with the school. The town of Ratingen is patron of the school, so the town’s coat of arms is flying next to our Amina flag. 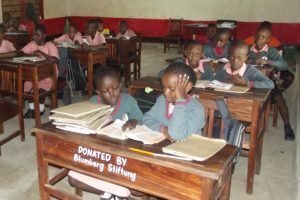 Also from Ratingen is the Blumberg Foundation, which donated classrooms and also launched a “matching grant” which takes on one sponsorship for each new sponsorship derived from Ratingen. Then there would be the Claus Family Foundation, which supports several schoolchildren and, of course, is based in Ratingen. And if I am already in the process of praising the tiny neighbour town of Düsseldorf over the green clover: There are also the support group of Diakonie and Caritas and the dental practice of Dr. Brauner + Dr. Renden who are funding the free basic medical programme MMMS for the RPS students. Thus all roads lead to Ratingen, at least almost all. The Reiner Meutsch Foundation Fly & Help is located in the Westerwald, but that has not prevented them from funding the huge expansion of the school by five classrooms, a teacher’s room and a library in the year 2015. 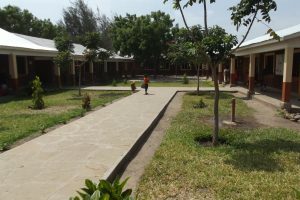 With RPS we have succeeded in making Mekaela Academies affordable even for low-income Kenyans. School fees are almost two-thirds lower than in our other schools. This occasionally requires to compromise in terms of quality and quantity, but that does not seem to be at the expense of the performance of the students. Internal comparisons recently showed that RPS performs better than MAS and LPS. 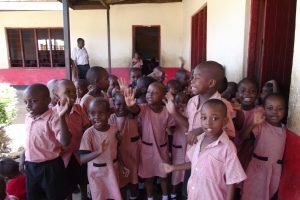 Thanks to the numerous sponsorships, but also the low school fees, the number of students increased from 100 to 360 in just three years. RPS is now operating at full capacity. The success of RPS has shown that families with very low incomes are also striving to provide their children with the best possible education, even if they have to cut back on other issues. We are therefore convinced that a secondary school on the basis of this concept would meet a very high demand. 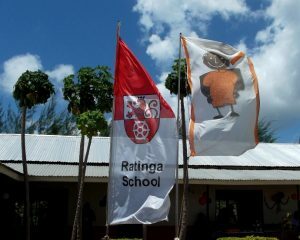 Perhaps Ratinga will not be our last school for long, who knows.